After working here in the Lilly Library for several years, I have come to take it a bit for granted. I walk in the door, greet whomever is about and head to the Central Office for my mail and the news of the day. I walk to the stairway near the elevator and head to the Archives. As I fish out my keys and go to unlock the door, I am reminded of the history of this building. In the 1990’s the Lilly Library was substantially remodeled and expanded. The front doors were removed to create a better entry. These lovely brass doors were then reused by the architect as the doors to the Ramsay Archives. The transom that sat above the doors is now a window in my office. I have been thinking a lot about the Lilly as it was when built 50 years ago. 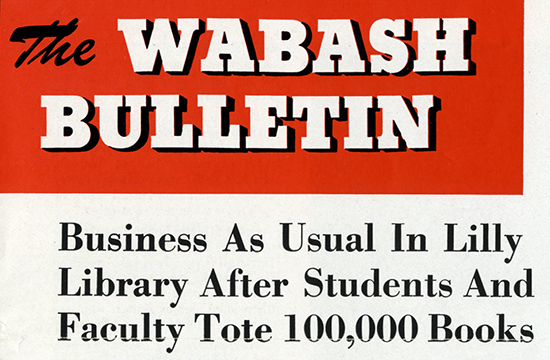 This month marks the 50th anniversary of the dedication of the Lilly Library. There is a display on the main floor with lots of images of the “new” Lilly. This exhibit includes a nod to the Library’s biggest donor, Eli Lilly, and the groundbreaking for the Library. As the photos above show, the furnishings in the Lilly were bright and cheerful. Near the exhibit on the main floor, we gathered what is left of these original pieces and put together a lounging area. Thanks to the eagle eyes of a member of the college community we were able to retrieve one of the bright gold chairs pictured in the display from across campus. 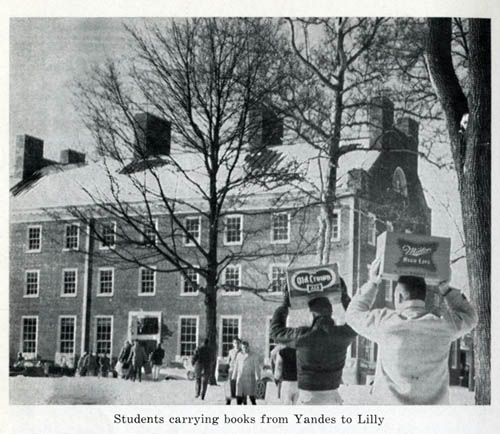 Of course, the really dramatic news surrounding the new Lilly was the move from the old library in Yandes Hall. The Lilly was finished in early January and ready for business. However, arrangements were needed to move the 100,000+ books across the mall. This was done by the students in extremely cold weather. The memory of the move has stayed with them for all of these years. In fact the Class of 1959 were seniors that year and are returning for their 50th reunion at the Big Bash this June. Among the images they requested was something connected to that great move. As you can see it was really cold. The students, faculty and staff who were moving the books were treated to hot coffee, hot chocolate and doughnuts. While the students were hauling the books across the mall, faculty and staff members were ready for them in the new library. Pictures show them directing the students where to place the books. In this picture we see the line of students on the way over with books and students and faculty toting empty boxes back. You may note the the boxes are for beer bottles, this was because they were very sturdy and had good handles. It is noted in every article that these were provided EMPTY by a local distributor. The new Lilly Library was a big change from old Yandes with its dark stacks and crowded quarters. Byron Trippet notes that the third floor archives room became his quiet place and favorite haunt. I would like to think that he would find the new archives space a comfortable place as well. At least he would recognize the doors! I saw the early lobby pictures and thought “those chairs look so charming.” Then I realized they looked familiar–much like the beat-up chair in my office (a former storage closet). I have thought about moving it out, but it is so nice to sit and grade papers in, and sometimes take a nap! I had no idea it had such lovely history!